In the General window, you can enable and disable different settings and functions for the system. 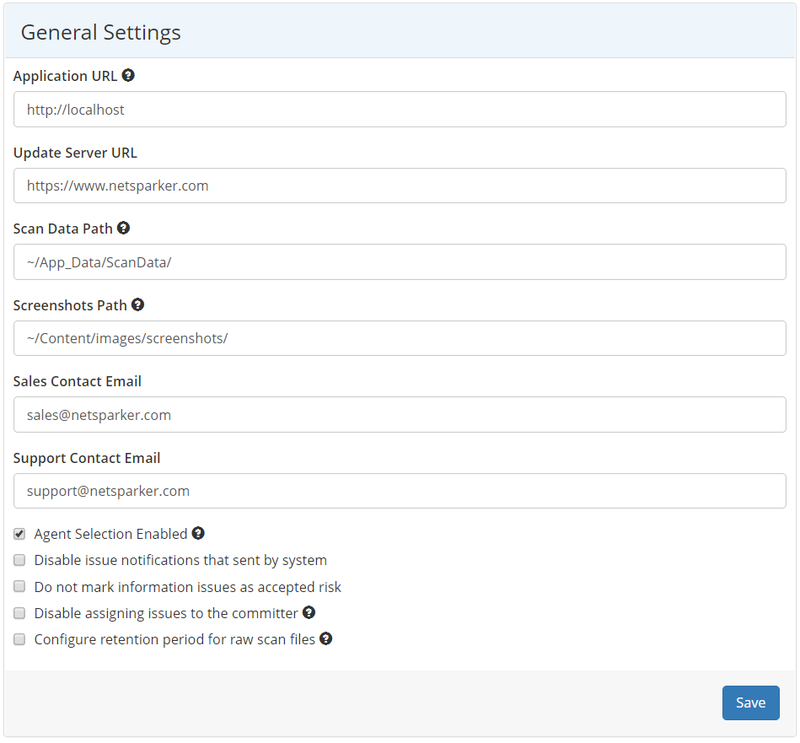 There are additional settings in the Netsparker Enterprise On-Premises edition. For further information, see Overview of Settings in Netsparker Enterprise, Netsparker Editions and Comparison Between Netsparker Enterprise and Netsparker On-Premises Edition. This table lists and explains the fields in the General Settings window. This is the URL that will be used to generate all system URLs. This is available in the Netsparker Enterprise On-Premises edition only. This is the URL that will be used to connect for updates. It has a static value that cannot be changed. This is the directory path where scan data is stored. If you change this path, you should move the existing files from the old location to the new one. This is the directory path where screenshots are stored. If you change this path, you should move the existing files from the old location to the new one. This is the email address of your Sales Contact at Netsparker. This is the email address of your Support Contact at Netsparker. Enable this option to allow users to select an Agent (a service application that executes scans) when launching a scan. It is enabled by default. This enables Netsparker support to see your account. This is available in the Netsparker Enterprise On-Demand edition only. This enables Netsparker support to edit your account. Enable this option to disable Issue notifications that are sent by Netsparker. Enable this option to prevent Information Issues from being automatically marked as Accepted Risk. 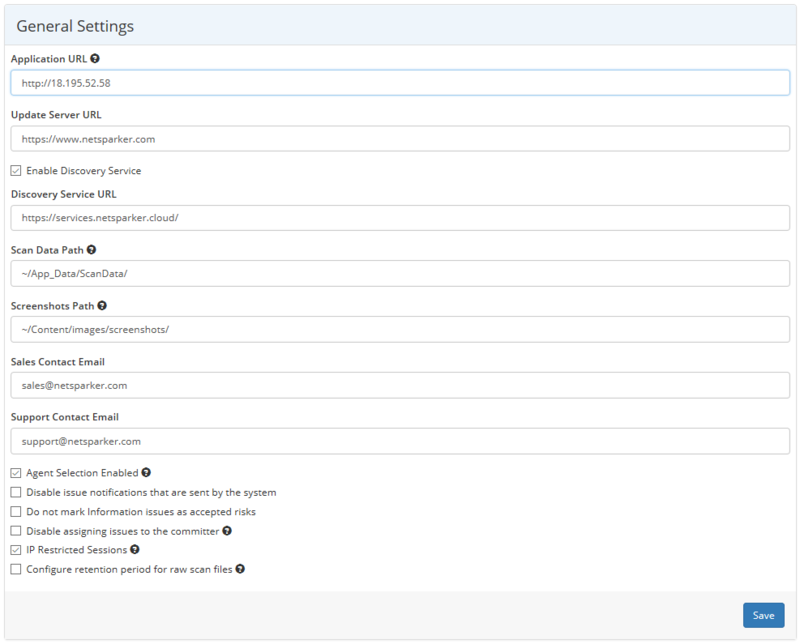 Enable this option to disable the assigning of Issues to the committer during scans triggered by any Continuous Integration System. Disabling this setting means that Issues are assigned to the Technical Contact. Enable this option to add extra security protection by making user sessions IP restricted. Once enabled, the same cookies can not be used to access the session from different IP addresses. Enable this option to configure the raw scan file retention period time in days. Raw scan files are needed for incremental and retest scans. From the main menu, click Settings, then General. The General Settings window is displayed. Which Edition are you using?